Will I be stripped of my Nice Jewish Girl status if I tell you that the Moskowitz family actually has some pretty sweet Christmas traditions? We are spiritually, religiously and culturally Jewish and so do the usual Chinese-food-and-a-movie thing on Christmas eve along with all the other Israelites in my hometown of Santa Rosa, CA. But after that, it’s Moskowitz Secular Christmas Time. After our chop suey and egg rolls, we head back to my parents’ house where my mom gives us all special Christmas eve pajamas (Yes, I realize that I am almost thirty. She gives them to my fifty-eight-year-old dad too.). We all put on our new pajamas, sip spiked eggnog and and listen to my father play the piano (Do you hate me for my nauseatingly nuclear family yet? Hope not.). In the morning, we exchange presents and eat an extravagant breakfast courtesy of my mom, consisting of mimosas, coffee, eggs, bacon and monkey bread—a lovely, sticky, caramel-y combinations of fluffy biscuits, cinnamon, melted brown sugar and butter. Lots of butter. 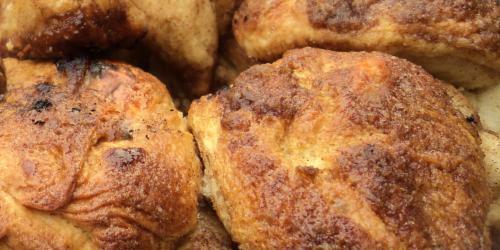 Most people make monkey bread using canned biscuits and, though it’s delicious any way you make it, I wanted to give it a shot using a fresh egg-y yeasted bread dough. The result: scrumptious. Like one big brown-sugary cinnamon roll. I don’t own a Bundt pan, which is what is typically used for monkey bread so I went free-form and it worked just fine. Feel free to use a Bundt pan if you have one though—it’ll ensure a prettier, more cohesive result. 3 tsp ground cinnamon $1.50 for 1 oz. Preheat oven to 350. Grease a baking sheet or Bundt pan liberally and set aside. Combine the milk, yeast and honey in a large mixing bowl and set aside, allowing it to activate for 2-3 minutes. Add the egg, 4 tbsp of the melted butter, the flour and the salt and stir well to combine. Continue stirring until a soft dough forms. Turn the dough out onto a floured surface and knead for about 8 minutes (this can also be done in a food processor or stand-up mixer for about 4 minutes). Transfer kneaded dough to a lightly oiled bowl and cover. Let rest in a warm spot for 30 minutes. Combine the brown sugar and the cinnamon in a bowl. Stir well and set aside. Set the remaining melted butter in a small bowl next to the brown sugar-cinnamon mixture. Turn risen dough out onto a lightly floured surface and use your hands to pat it into a 6” x 8” rectangle. Use a sharp knife to cut the dough into about 48 1” squares. To form the bread, lightly flour your hands. Pick up a square and roll it gently between your hands until you have a round ball. Dip it in the butter and then immediately into the brown sugar-cinnamon mixture and place it on the prepared pan. Continue with the remaining dough, butter and brown sugar-cinnamon mixture, piling the balls on top of each other in sort of a stacked wreath. Cover loosely with plastic wrap and let sit for fifteen minutes in a warm spot. Remove plastic wrap and bake monkey bread for 25-30 minutes, or until brown and sticky. Serve immediately.